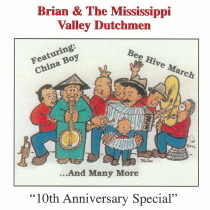 Brian and the Mississippi Valley Dutchmen continue to play the fine concertina feature music of the Upper Midwest! Brian Brueggen comes from a long history of music making in the state of Wisconsin. His cousin is Gary Brueggen from Gary & the Ridgeland Dutchmen. Brian Brueggen continues to entertain with his concertina and leads Brian & the Mississippi Valley Dutchmen. This concertina driven music is sure to please many. There are some original compositions within his music as well as many standards from the Upper Midwest! Don’t pass Brian & the Mississippi Valley Dutchmen! Please see their many other CDs on PolkaConnection.com.